We were challenged to attract a younger Millennial audience to the stock category in a foodie and inspiring way. 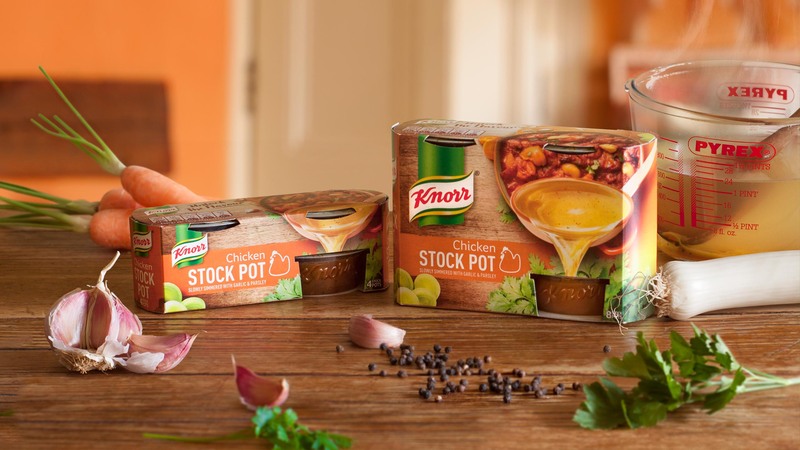 We were asked by the Knorr global team to shake up the stock market by looking at the positioning and re-design of Knorr stock pots. Our challenge was to create an identity that had more appeal to a younger, Millennial audience. These highly visual, foody, taste chasers want to create experiences with their dishes by customising their food to create exciting, tasty, wholesome eating occasions. Millennials expect the full package… including the packaging. As an absolute British family staple the Knorr stockpots have a special place in consumers hearts, so we worked hard to hero the brand equities while giving overall packaging a design re-fresh. By injecting some taste appeal into the design through scrumptious food photography, the packaging works harder in the retail environment and pulls on Millennial’s curiosity for cooking. The use of bright rich colours as part of the design lock-up adds a flavour punch to the design and also helps consumers shop the variety of great flavours available within the range. An exciting, foodie and inspiring design solution to tempt Millennial shoppers into the category.